As a baseball fan, I have a slight love-hate relationship with umpires. Like all fans, I am frustrated when a call goes the other way. Not so much if the call is correct. But when a call is obviously wrong -- at least, obvious to me -- I do get ticked off. "Hate" is a strong word, and the wrong word. When the man in blue blows a call, it's more like, "What the heck are you doing?" and less like "Kill the umpire!" I've met some umpires at various levels of baseball, but none above the minor league level. During the Minor League umpire strike back in 2006, one of the replacement umpires agreed to talk with me after the season was over. That was easy, since I have known the guy for years. Other umpires in other leagues that I've met seem like nice guys. They're out there doing their jobs, doing their best. And, like any job, sometimes mistakes happen. Organized baseball doesn't talk much about any situation where umpires are involved in any disciplinary action. That goes for Major League Baseball as well as Minor League Baseball. And the independent leagues. But, every so often, you do find out about actions involving umpires. And I'm wondering now, if organized baseball is looking at a particular Minor League umpire's performance. Earlier this month, I noticed an umpiring performance that looked a little off. Sure, umps make mistakes. But this one game, on July 8, between the Columbus Catfish and the Kannapolis Intimidators (White Sox), caught my attention. Now, I wonder if it's caught the attention of Major League Baseball. 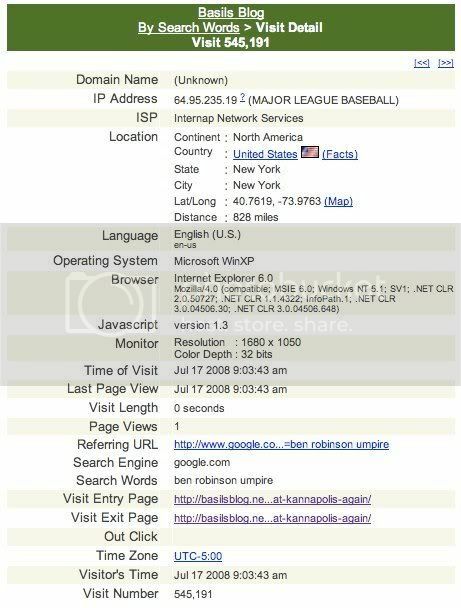 Someone at Major League Baseball was searching Google for "ben robinson umpire." Now, sure, it could be that someone, maybe a relative or friend, is simply doing a search for someone they know. I could easily have been a search for anything -- say, Jamie Lynn Spears -- but it's coincidentally an umpire I blogged about. Or, it could be that Minor League Baseball, which is affiliated with Major League Baseball, has received complaints, and they're using the Internet in their research. Or, it could be something else entirely. But, I followed the Google search. And found a few things I thought were interesting. First, the top search result was my post about the July 8 game where the umpires blew some calls. Then, I saw where many of the search results included phrases like "ejected by HP umpire Ben Robinson," "ejected by 1B umpire Ben Robinson," "confronts plate umpire Ben Robinson," and "Plate umpire Ben Robinson then threw out" among others. That could mean a couple of things. One, it could be that lots of folks argue with Ben Robinson. Two, it's news when someone is thrown out of a game, and not news when they're not. How many ejections occur when Robinson is calling plays? What's more important is how many happen when he umps compared to other umps. If there's a large variance, then that indicates a problem. But I'm not in a position to say that Robinson is a problem. I've seem him umpire more than just the one game. I didn't notice a problem other than that one game. But there are others who see him a lot more than I do. If there's a question about his abilities and performance, I'm certain Minor and Major League Baseball will speak with those: players, managers, other umpires, baseball scouts, media, and others. And, I'd like to feel confident that Minor and Major League Baseball will handle things properly, if there is a concern. But, the fact is, I don't feel confident about how they'll handle it. I mean, they let Barry Bonds keep playing. And now the all-time and single-season home run records are suspect. Baseball didn't do the right thing. I have confidence that most minor league ball players are doing their best. The field staff of the teams, too. They struck out with me a long time ago.